Over at the Food Section blog, is a post about the irony of the new cookbook from "Top Chef" alum Fabio Viviani, and the likeness of the book's images to a photo from another chef cookbook. 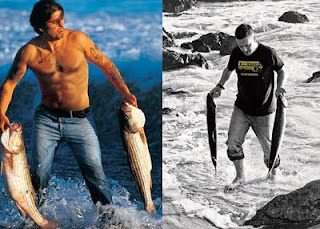 The above image of Ludovic Lefebvre (left) from his cookbook Crave is strikingly similar to that of Viviani (right) in his new book: hunky bad boy chef dude trampling through the waters with rock-solid abs and rolled up jeans -- seemingly snatching two giant fish from the water with nothing but bare hands. But back in 2005, staff writer, Leslie Brenner, went fairly giddy and ga-ga over the photo of Lefebvre on the pages of the Los Angeles Times: "Look at him, emerging from the surf like a chef-Adonis, kelp fairly dangling from his biceps. He caught those big fish with his bare hands!" In any case, hot bods, badassed tattoos, and bare-handed fishing...oh, my! Which truly begs the question: At this rate, who needs fishing poles?